Welcome to this issue of Experimental Sewing! 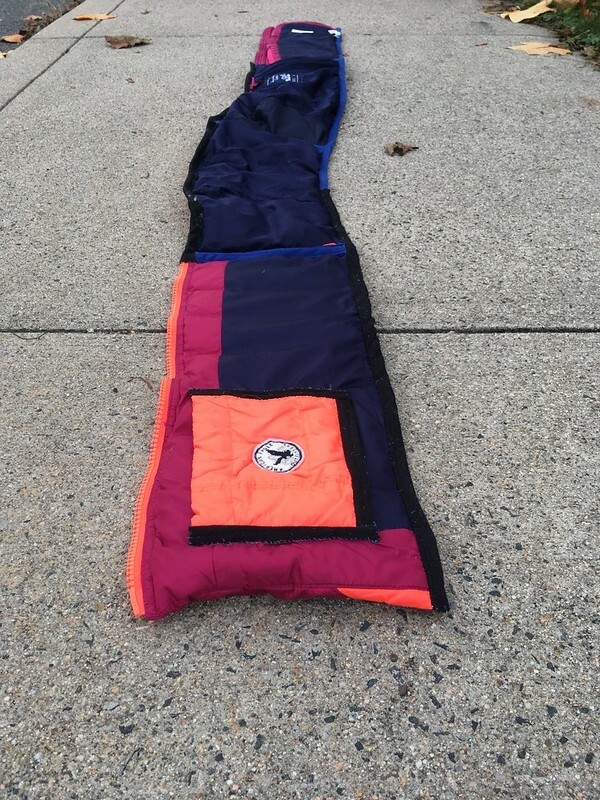 Today’s project involves turning the remnants of a down jacket (from this past project) into a scarf. 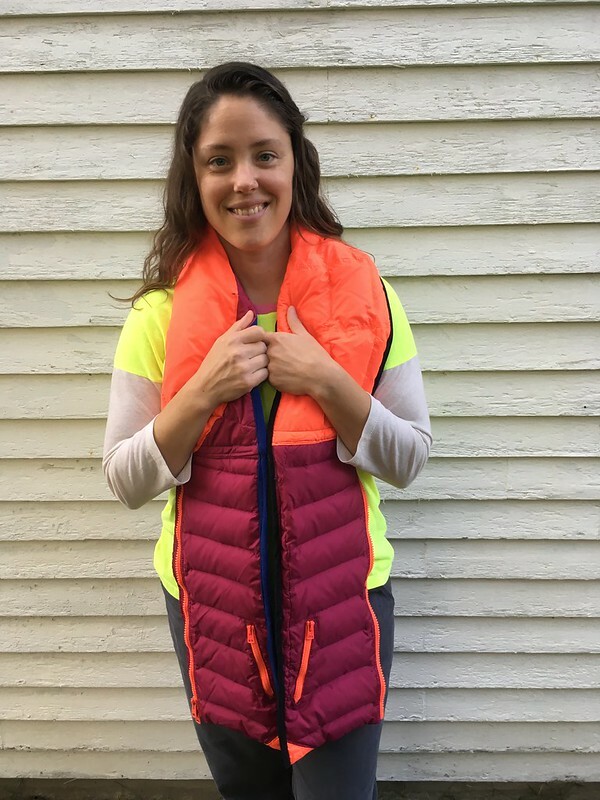 After seeing the scarves Alabama Chanin and Patagonia made from worn out Patagonia jackets a few years ago, I reallllly wanted to try it for myself. 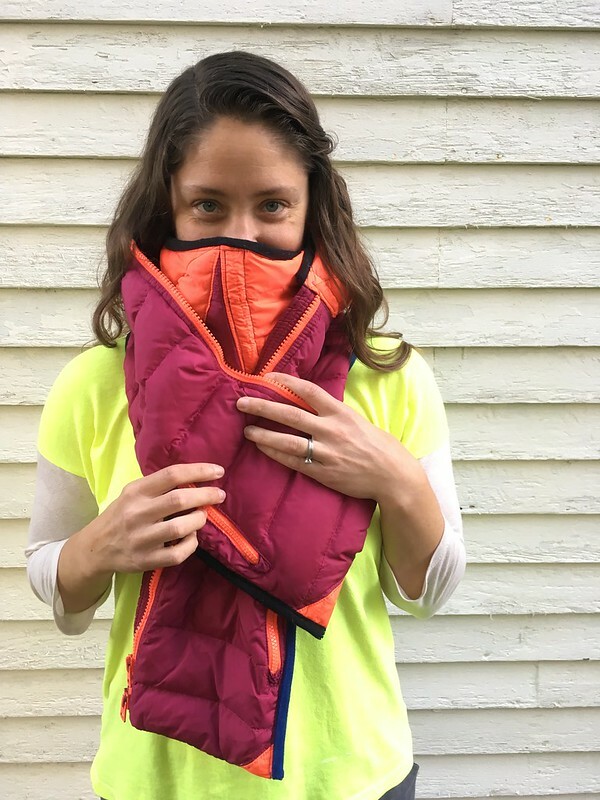 I thought it was a cool idea, and I was intrigued by the thought of recycling a down jacket (plus, I couldn’t pay $90 for one of theirs just because I was curious). It was time to get sewing. I decided at the outset that my goal wasn’t perfect, heirloom sewing. 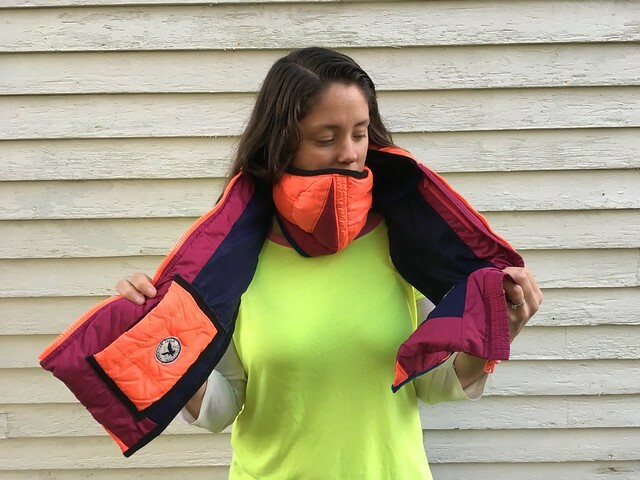 Undoubtedly the Alabama Chanin + Patagonia scarves are amazing in quality and workmanship, but I didn’t want to worry about that. I just wanted to know if I could do it and what the process would be like. Let’s talk process for a bit, and discovery. 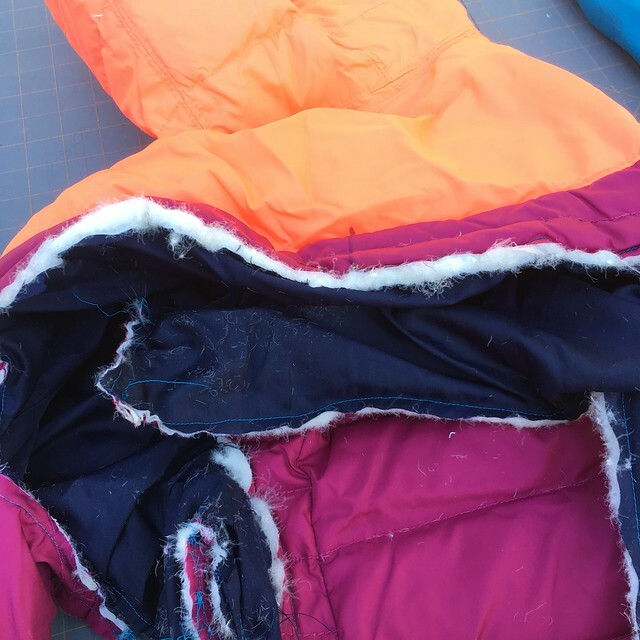 I looked at what I had left of the down jacket, and marked off pieces with my sewing marker that were as rectangular as possible. Then I sewed a straight stitch on either side of my cutting lines. After that, I cut my pieces up. And then I sewed them back together…as you do. 😉 This left me with something like a long rectangle, but also some exposed, slightly downy edges. And that’s when I made my discovery. 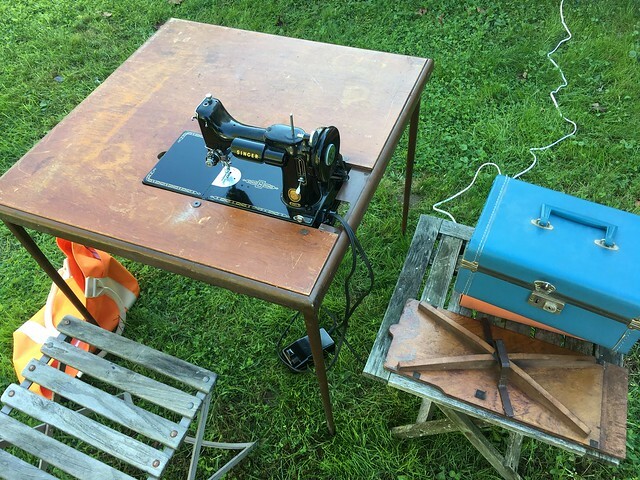 I went to an estate sale and came away with, among other things, fleece binding! I had no idea this was a thing you could buy! It was perfect for my project. Rather than buying more to match things, I just decided to use what I had to cover the seams joining the rectangular pieces and the edges. 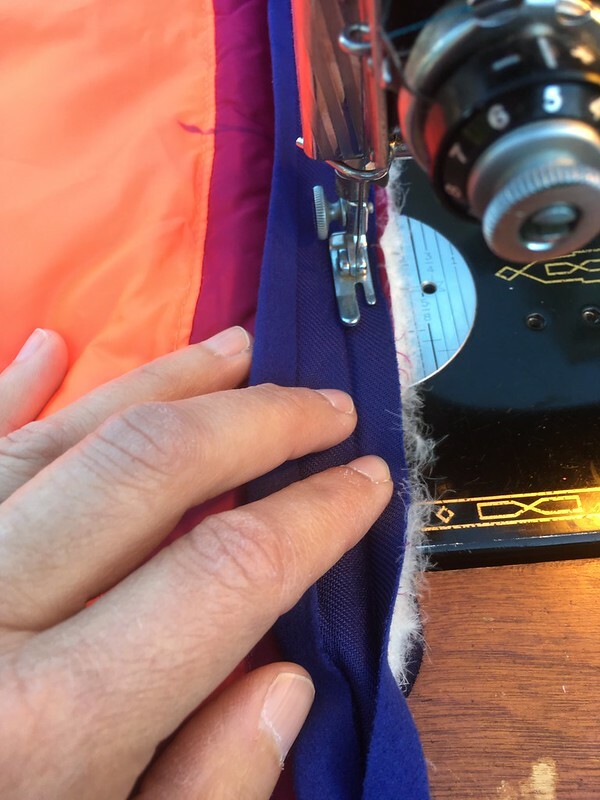 There was a little hand-sewing involved where the binding crossed from side to side, but not much. Before I finished, I also sewed a little rectangle to the inside of one end so that you could weave the other end through, helping to keep the scarf on. I don’t think, after doing this, that I’m going to set up shop making a million things from down. It was fun, but not so much that it’s going to be my new favorite thing. What IS one of my favorite things in sewing is trying out different fabrics, and this definitely scratched that itch. I’m pushing the boundaries of my sewing knowledge a little more each time! That’s a win. I just checked out the new cookbook from Deb Perelman of Smitten Kitchen, called Smitten Kitchen Every Day. I’m still reading through it, but after only making it through the Breakfast section, I want to make every recipe. Seriously. I might need this cookbook. I feel I would be remiss if, after this project, I didn’t recommend Wrights fleece binding. 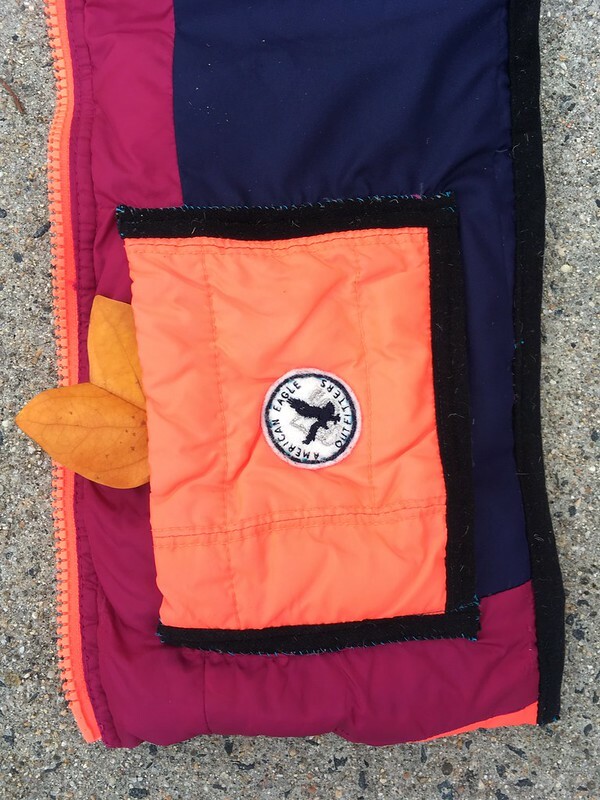 I can’t get the great fabric/color combination of this Kelly Anorak sewn by Lauren of Guthrie and Ghani out of my head. Oh! And one more since we’re talking fabric. I LOVE this Neon Neppy fabric from Robert Kaufman, and I can’t decide which one I love best: Blue, Royal, or Charcoal? The internet really doesn’t do it justice–it has little slubs of neon color throughout, and since I’m clearly in a speckle as well as a neon phase, it’s right up my alley. Well, I can’t believe it. May is over and it’s time to wrap up Me-Made-May ’15 with pictures from the last three days. The first of these is a Friday, which had the theme “Your Town”. I picked something that represented this area rather than something specific to my town: clamming and shellfish! Shellfish are a big industry here and for the last few summers, I’ve taken out a recreational clamming license (see here and here), so I tried to take a few shots with some shellfish-related props. My me-made clothing piece is this shirt (which you may remember from Day 16) made from a bedsheet and pajama pattern (M6848 by McCall’s). Day 30 was two layered Alabama Chanin pieces. The top layer was the Alabama Chanin corset from Alabama Stitch Book you saw on Day 25. The layer beneath is the short fitted dress pattern from Alabama Studio Sewing + Design. It’s a variation of the dress I wore on Day 28. The dress alone wasn’t inspiring me that day, so I thought I would make it more interesting with some layering. I love how they layer pieces in Alabama Studio Sewing + Design, so I decided to go for it, and I loved it! I will say that this type of layered outfit is not your friend in the hottest, most humid weather, though. With the camisole as the base piece, I was wearing three layers on top which got a little bit warm. And the final outfit for May? This dress which I copied from a vintage dress. I think the fabric is silk. My husband’s parents were kind enough to give me my pick of his grandmother’s sewing supplies after she passed away, and this is one of the fabrics that she had in her stash. It’s very light and comfortable. Final thoughts? This was a great challenge both from a sewing and a fashion standpoint. I had to really think about what I had made and how to wear it creatively. 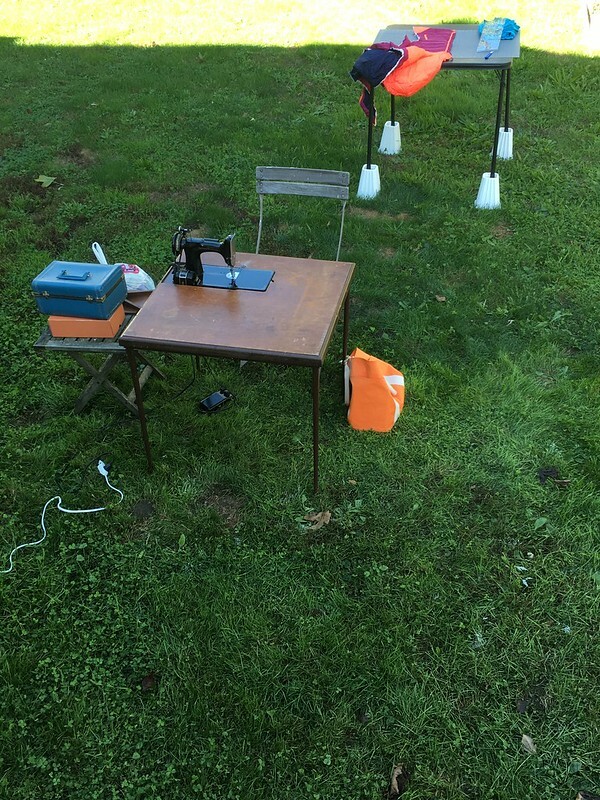 I had more makes than I realized, and now I’m inspired to sew even more of my clothing. It was extra mental work to figure out new outfits (I tend to repeat a lot more in my normal daily life), but I think that was good for this set time period. It helped me to think of new ways to wear what I had, and seeing my outfits through the eyes and comments of others helped me to take a new look at them. This challenge also made me practice thinking through how to take pictures. Thanks go to my photographers, my daughter and my husband. They did a great job! And thanks to YOU for tuning in throughout the month. I hope you enjoyed it as much as I did. Wow! I feel like I’m writing a post that says, “HEY, EVERYBODY! LOOK AT ME!!! !” I guess I kind of am… So, after you LOOK AT ME!!! and my outfits, look around me! We have flowers! We have leaves! We have grass! Spring is finally here and we even had some warmer weather which is awesome because it’s warmer weather and because it means I got to add a little more variety to the clothing I could wear that I had made. There’s no way I’m making it through this month without repeats, but it’s a great exercise in creativity and it makes me want to sew even more, and that’s a good thing. 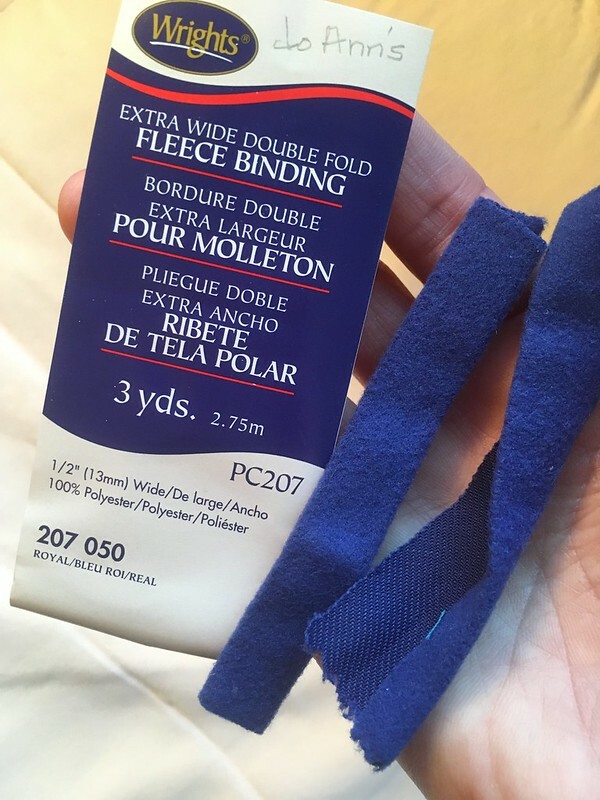 Remember when I was doing all the sewing with Polartec? I made the skirt, the dress, a pair of pants that didn’t make it on the blog because instead of fitting me, they fit my child, and a cardigan that has yet to make an appearance here. So, while I’m currently still busy with bathing suits, I thought I would show you this cardigan that I sewed just a little while back. Don’t worry though; once I test out my latest bathing suit top, we’ll talk bathing suits again. This cardigan was made from McCall’s 6844. I was completely inspired by Bianca’s green jersey version, and would still love to make one like hers someday, but since we seem to be living through a Canadian winter in Massachusetts this year, fleece was more seasonally appropriate. I made it with the same Polartec Classic 200 Sweater Look fabric from Mill Yardage as the pieces I mentioned above. I made a medium of View C, which has a shawl collar and a high/low peplum. Thanks to the many reviews on the Pattern Review site, I skipped the interfacing in the collar and sewed the sleeve in flat. Also, despite what the pattern says, the front does meet, so I debated adding a closure, but skipped it in the end. I liked the idea of modelling this in the snow while also wearing the red shirt I made so, on a “warm” day in the 20’s (Fahrenheit), we went out and took some pictures. Here’s a shot of the red shirt in action, too. 😉 The shirt was sewn from an Alabama Chanin pattern. See the link for more details. Next up (probably): more bathing suits!!! To survive in this household, most garments have to be able to make it through the washer at a bare minimum. The dryer is negotiable. So, it was with fingers crossed that I threw this one in the washer and dryer. After consulting the experts (my mother and grandmother), I took the trim off. I looked for more in the fabric store (so many good rhyming phrases today! ), but nothing had the same pizzazz as my beading. I could have tried beading it myself or something, but that sounded like a lot of work for a t-shirt of questionable fabric quality. So in the end, I cut some strips of t-shirt fabric and bound the edge using a zig-zag stitch. The zig-zag was so wide it looked homemade in the worst way. So, I ripped it out again and tried one more time. The third try was the ticket. I like this finish so much better. I sewed a little seam at the front to make it look v-ish. Now it kind of makes me think of this old GAP t-shirt I used to have that had a rough-stitched look to it. That was a great shirt. Its spirit lives on. I’m so happy to have a wearable shirt. I needed a few good t-shirts with some small, interesting details to form the base of my winter fashion ensembles. 😉 If anyone has an awesome boat/bateau neck pattern that they love, please leave it in the comments. I’ve been contemplating that in black for occasions when I want to look put together but still wear a t-shirt. 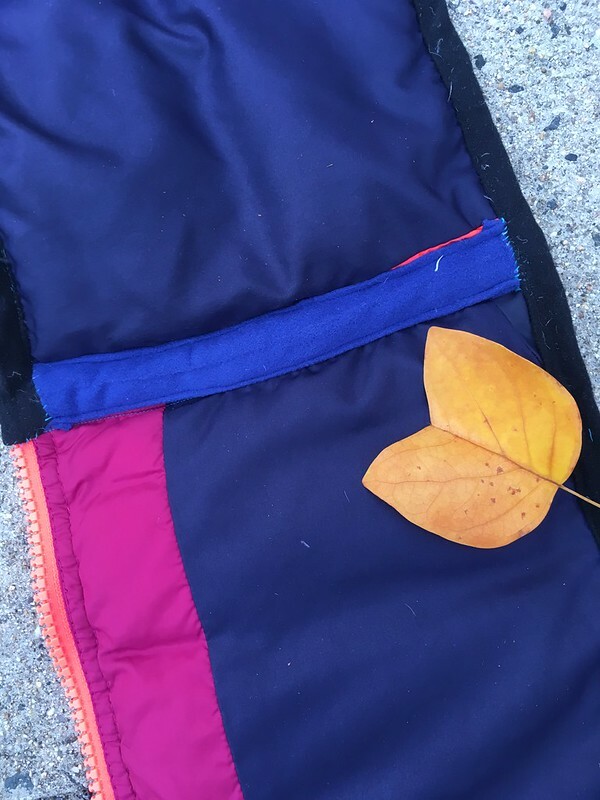 In my now decade-long quest for THE ULTIMATE WINTER SKIRT, I have thought of many fabric combinations, patterns, and crazy ideas to create a long winter skirt that would be warm and yet still look good. What I really want is a skirt that feels like I’m wearing a blanket, but looks socially acceptable. To that end, I ordered a vintage pattern, and started poring over fabric sites looking at faux fur. I went through my fabric cabinet and considered (finally) using some of my wool. I even thought about cutting up our Vellux blanket as lining. 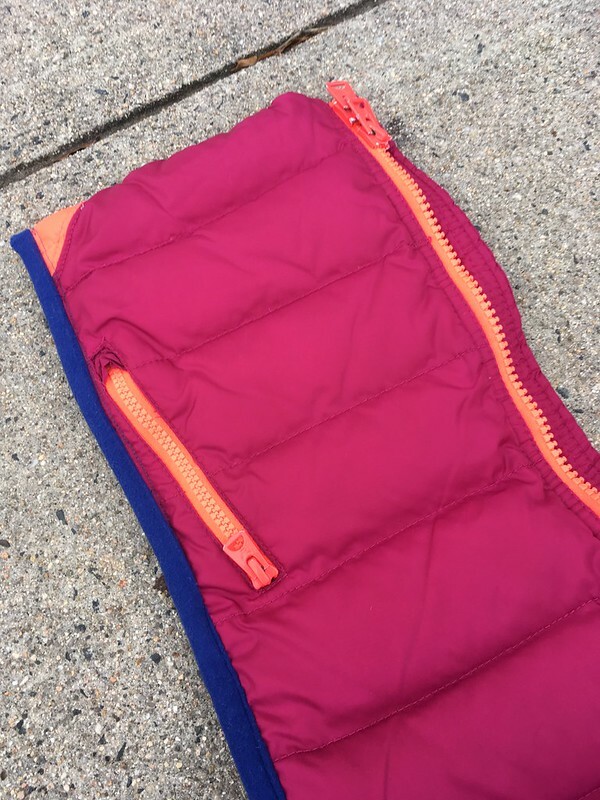 The Polartec website became very familiar to me as I researched interesting technical fabrics. Finally, it dawned on me. 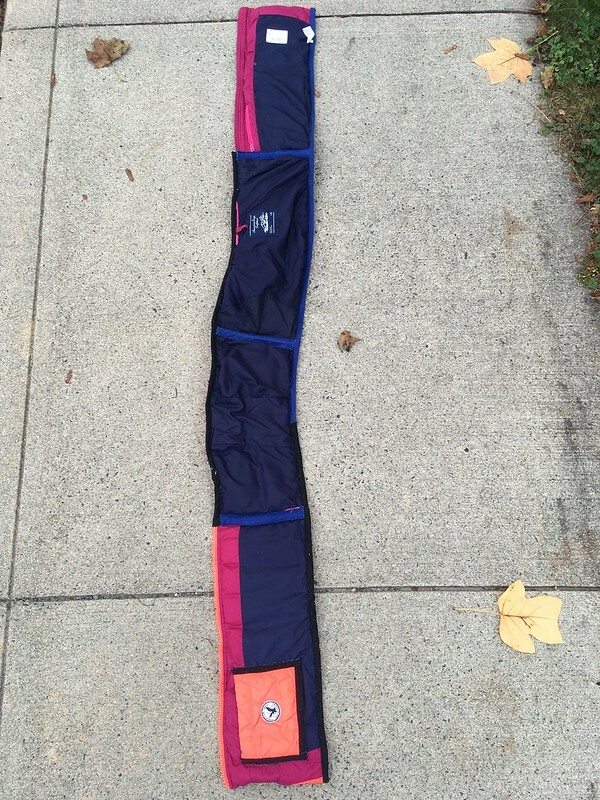 Why not make Version 1 of THE ULTIMATE WINTER SKIRT from a pattern I already knew I liked? What about a Polartec sweater knit (which I was itching to try out anyway) with the Alabama Chanin Long Skirt pattern from Alabama Studio Sewing + Design? The more I sew, at least lately, the more I find that what I’m interested in doing is exploring. As I contemplated what I wanted to sew in the coming year, or at least the current season, I realized that I want to try out new and interesting fabrics in (hopefully) new and interesting ways. My wonderful husband obliged me by purchasing a large amount of sweater-knit fleece in a charcoal color from millyardage.com as a Christmas gift. Goal number one with that fabric was to attempt the skirt. I cut out the same size in the Alabama Chanin Long Skirt that I usually use (I’ve also made this skirt in cotton/modal jersey. ), and bound it with fold-over elastic that I already had. 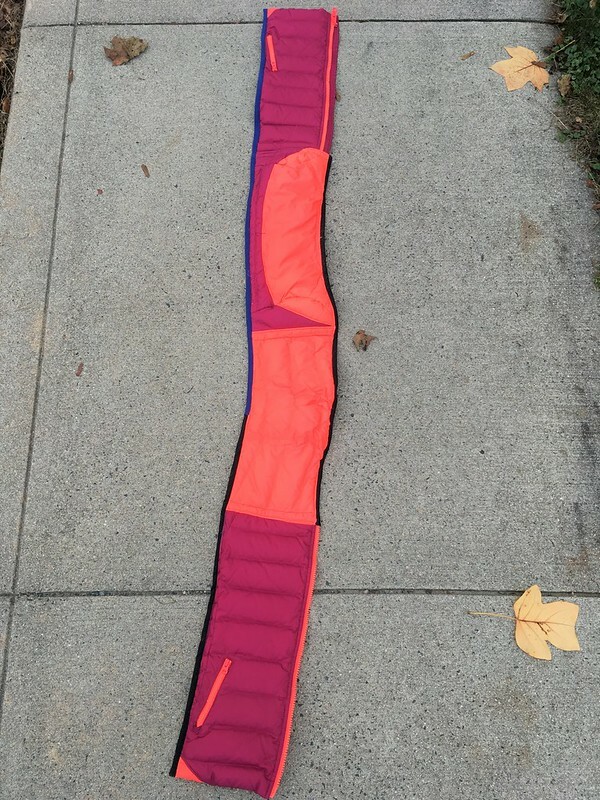 I didn’t stretch the elastic when I was sewing, though, so the waistband came out looking…wavy. So, in the interest of time and not losing momentum on the project, I cut off the waistband and sewed on another, this time stretching the elastic as I sewed. It was still a bit wavy, but the skirt is meant to be sort of low-rise, so when you put it on, it works. (Only one note of caution–if there is any chance you may have young children tugging on your clothes, watch it. There’s always the possibility you could get pantsed in this skirt. Can you get “pantsed” in a skirt? Whatever you call it, watch yourself–no one wants to lose the bottom half of their outfit in public…well, no one should want that, anyway. It could definitely happen in this skirt.) This particular pattern has a small train, which I love, and which I kept in the jersey version of the skirt. It does drag on the floor a bit, but it looks lovely. For this winter version, though, I trimmed the back even with the front, cutting off the train. It would be too sad to have the back of the skirt covered in snow, slush, and salt. As yet it is unhemmed, partially because I love the raw-edged look, and partially out of curiosity. I want to see how the length works with my various shoes and if I can get away with raw edges in this fleece sweater-knit as well as I can with a cotton jersey. I may hem it later. The other reason is that I want some instant gratification on this pattern, and I can call it done if I don’t hem it. Now you know the whole truth. And now…I must tell you of my initial triumph. On Sunday I wore the skirt to church with a stretchy sweater and my wool “poncho” (a.k.a. piece-of-fabric-that-I-wrap-around-myself-and-secure-with-a-kilt-pin). I wore long johns underneath and booties with socks. On that day, I knew I had finally achieved an ULTIMATE WINTER OUTFIT. 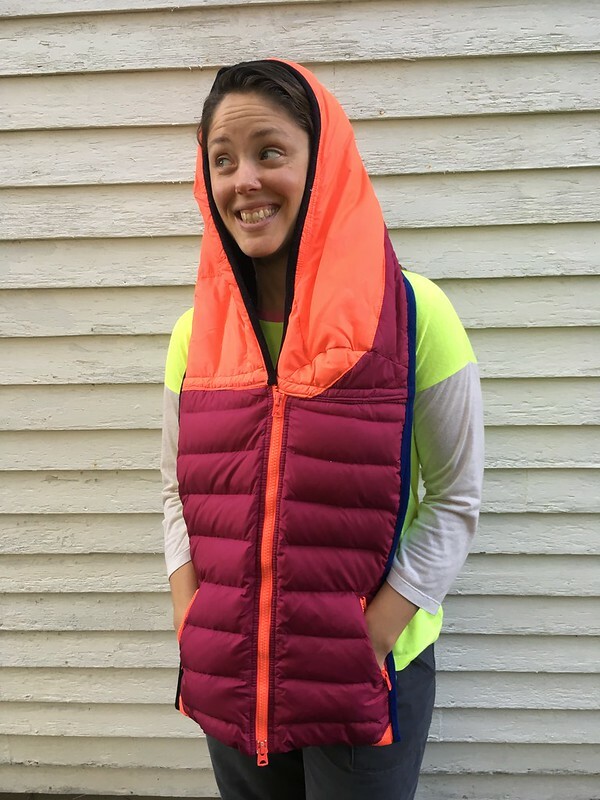 I was essentially wearing blankets and pajamas: long underwear (“pajamas”), a skirt that felt like a blanket, a sweater as stretchy as a t-shirt, and a “poncho” that was really a blanket wrapped around me. I was wearing pajamas and blankets, but it was socially acceptable enough that I felt like I had dressed up for church! But wait! Was I essentially practicing deception…at church, of all places?!!! Was I really wearing my pajamas and blankets to church?! Well, I’m going to say no to the deception, but YES to the awesome nature of that outfit. All winter outfits should have the qualities of ultimate comfort and warmth while still being socially acceptable and looking good. SUCCESS!!!! I feel that my life is now fulfilled. Blog, finished.